It is easy to understand why so many people come to Chiang Mai for a few days and end up coming back to spend a lot more time here or even relocate to this super progressive, artsy, foodie city set near gorgeous lush mountains. The city is quite large and diverse. 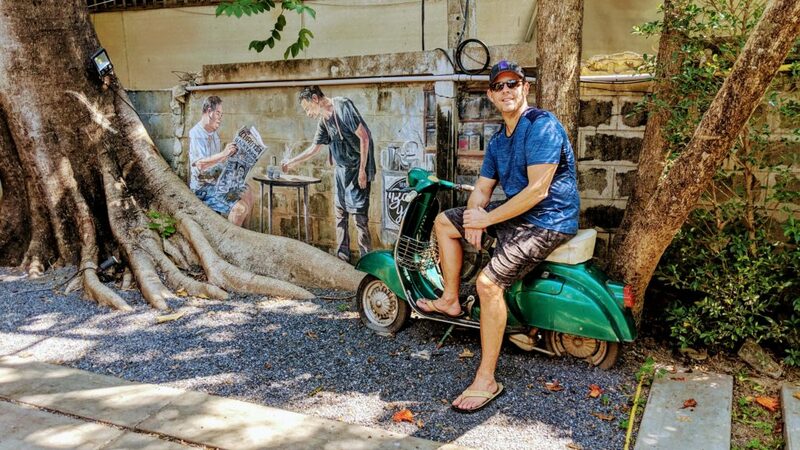 There are many fun neighborhoods to explore by foot while browsing cute shops, admiring street art, numerous bazaars and stopping for amazing coffee or food. Read about my favorite vegan restaurants. Chiang Mai is the largest city in Northern Thailand and means “New City” because it became the new capital of Lan Na when it was founded in 1296. Its historical center is the Old City, a roughly 1.6 km walled and moated square that’s home to over 30 Buddhist temples, some of which are as old as the city itself. As well-preserved as it is, Chiang Mai has modernized in many ways and expanded far beyond the walls of the Old City. 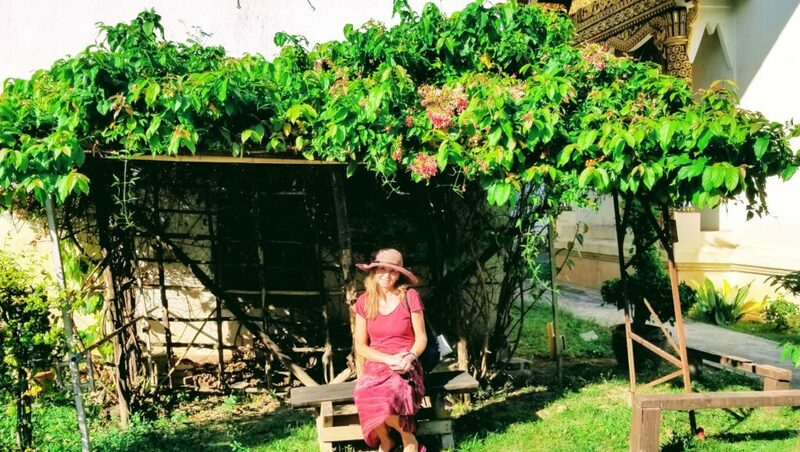 In fact, in recent years it has become a haven for backpackers and digital nomads alike – everywhere we went we found expats enjoying this fabulous city. 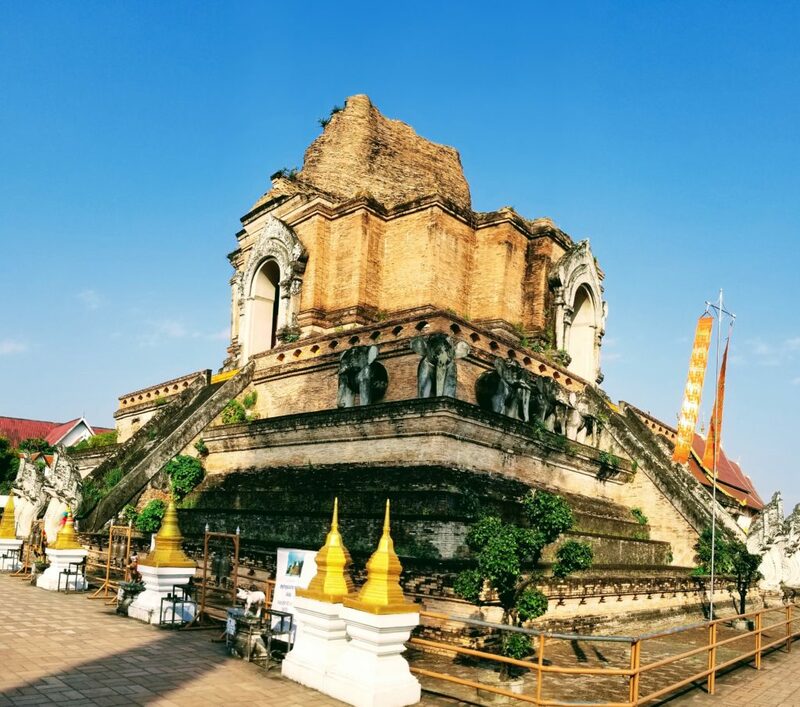 There are many reasons for their choice to relocate to Chiang Mai – the cost of living is quite low, there is fast and readily available wifi, the food is fantastic, the weather is good and the streets are clean. 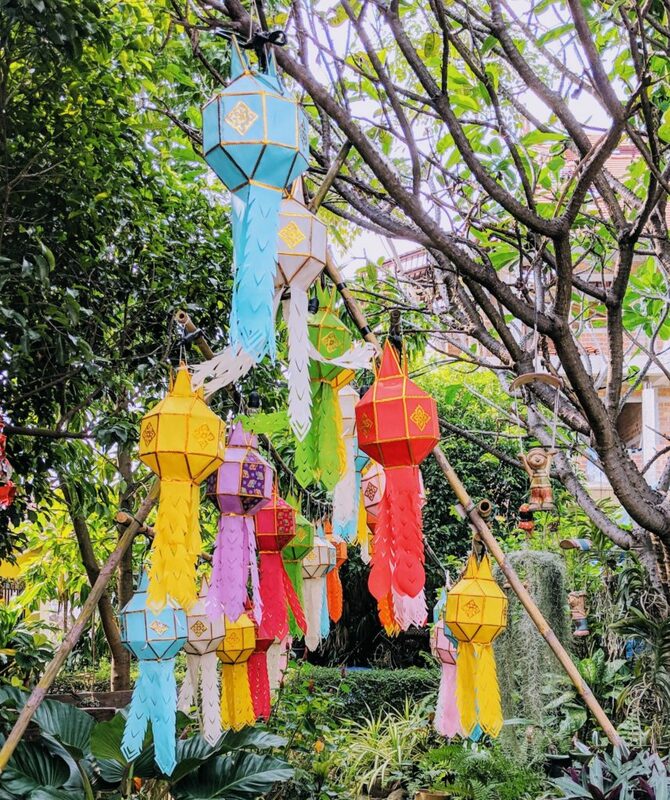 Accommodations in Chiang Mai are so inexpensive and there are so many of them, I am a bit disappointed that we stayed in a large hotel – it was fine, just not worth mentioning. It would have been much better to stay in a smaller B&B inside the Old City or in the Nimman neighborhood which is closer to the Chiang Mai University. Everyday we would set off from the eastern gate of the Old City to explore more temples, more neighborhoods and cafes. Everything is walk-able if you have the inclination and time. Otherwise there is always a Grab or a tuk tuk to take you wherever you want to go. In ancient times kings built temples to demonstrate not only their devotion, but also their wealth and power. Temples served not only as centers of faith, but also as schools and hospitals. 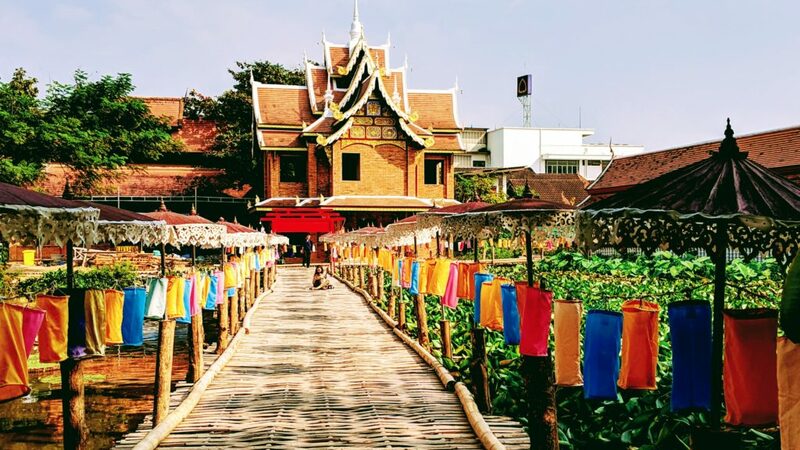 Today, temples are still a central part of Thai life and the holy structures of Chiang Mai are living, breathing places that serve as invaluable bridges to the past, keeping the people linked to the timeless traditions of their ancestors. 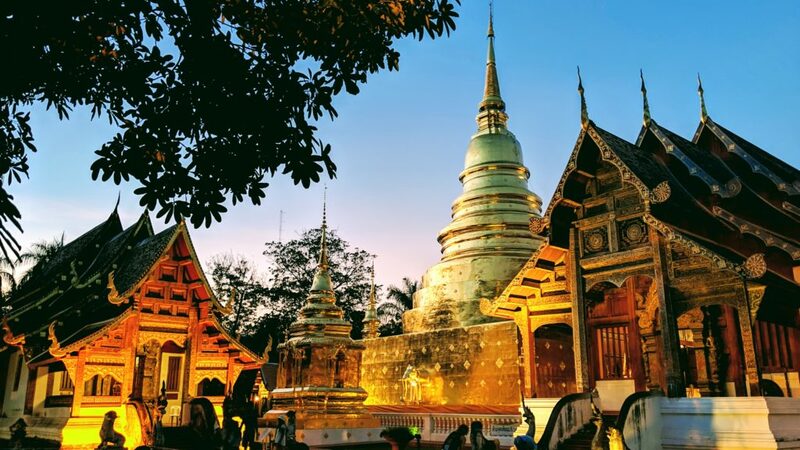 Chiang Mai has over 300 Buddhist temples which include: Wat Phra That Doi Suthep, the city’s most famous temple which stands on Doi Suthep, a mountain to the north-west of the city and dates back to 1383. 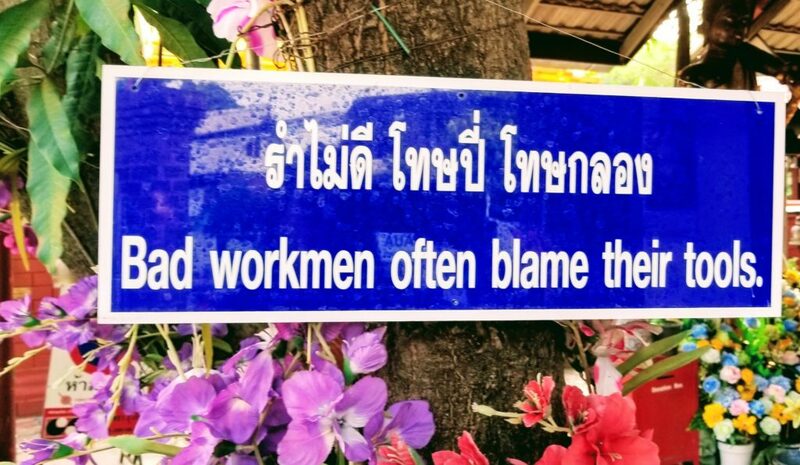 To do the hike from Chiang Mai to Wat Pha Lat and ultimately Wat Phra That Doi Suthep, follow this link. The second most famous temple is Wat Chedi Luang. It’s massive chedi (pagoda) was built sometime between 1385 and 1402 and is a distinctive feature of the Chiang Mai skyline. At its peak, the chedi measured 60 metres across at the square base and 80 metres tall and was once the home of the Emerald Buddha, Thailand’s most sacred religious relic. Damaged during an earthquake in 1545, the chedi’s height was reduced to nearly half of its original size yet it is still an impressive structure. The oldest temple in Chiang Mai is Wat Chiang Man which holds some important Buddhist images including a famous crystal Buddha. Construction of the temple started in 1306 with several parts being added in later centuries creating a temple complex which has varied styles of architecture throughout and lovely grounds. Built in 1345 Wat Phra Singh has since had a huge renovation in the 19th century. This highly venerated temple is one of the most visually impressive wats in Chiang Mai. The main temple building is the star of the show, featuring those iconic slanted Lanna-style roofs and an intricately decorated facade that shines brightly in the sunlight. 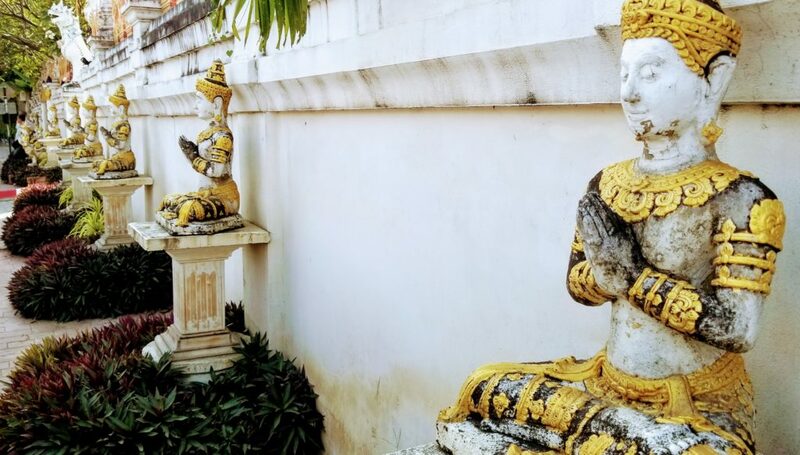 We found that the best thing to do is just to start walking through the Old City – with over 30 temples within the moat, there is plenty to see and as we expanded our route to the greater Chiang Mai area we found even more treasures on a daily basis. Chiang Mai’s Night Bazaar – located at the intersection of Chang Khlan Road and Loi Khro . Set up time is around sunset (usually about 18:00) and shopping goes on until about 22:30. Sunday Walking Street – The Sunday Weekend Walking Street is easily the most popular shopping experience in Chiang Mai. A vibrant spectrum of art, crafts, music and food – with handmade quality goods and souvenirs that echo the spirit of Northern Thailand. It starts at ThaPae Gate and runs all along Ratchadamnoen Rd, for around one kilometer. Every Sunday from 16:00 until around midnight. The road is closed to traffic during this time, and as one of the most popular tourist attractions in the city, it does get busy. Wualai Walking Street – This is a Saturday walking street market which is a lively and fun night bazaar that takes place just a short walk from the old city walls. It starts in the late afternoon (17:00) and continues until around 22:30. Located on Wualai Road, near the South moat of the old town. Warorot Market – This is more of a local food market (mostly NON vegan) with some clothes options and personal care products. It opens at 6:00 and closes at 19:00. Ton Lamyai Market – If you love flowers this market is ideal! There is nothing but flowers here and the scent is amazing. Great for a stroll, this market is open 7 days a week 24 hours a day – wow! Elephant Nature Park – The Elephant Nature Park is the elephant sanctuary to visit. The sanctuary was established in the 1990’s predominantly for distressed elephants and provides refuge to many other animals in need. The park has received numerous awards from institutions including the Smithsonian, Time magazine and National Geographic to name just a few. There are many options to observe these majestic beings including the possibility to overnight at the park and/or volunteer. Cooking Classes – Many restaurants in Chiang Mai offer cooking classes including many of the vegan restaurants I mentioned in my earlier post. The link has some recommendations. Spa Treatments and Massages – There are hundreds if not thousands of options for spa treatments and/or massages in Chiang Mai. Finding reputable ones that are clean is key. Although there are many high end spas, we found the Women’s Correctional Institution Vocational Training Center to be amazing. About $6 USD for a stellar one hour massage, while helping women get rehabilitated. After spending a magical week in Chiang Mai we left wanting much much more and knowing that we will definitely be back and soon!